If new media is the hot, young neighbor on the block, then television is like the grand dame holding court in the mansion up the street. She’s clearly the richest lady in the county, and eventually everyone comes knocking to pay homage to her. First up is Twitter, which furthered its efforts to ingratiate itself with big league TV advertising through a few newly announced initiatives. Twitter Amplify brings TV partners on board with real-time video streamed directly in the service, giving broadcasters BBC America, FOX, Fuse and The Weather Channel some additional advertising and second-screen promo opportunities. Of course, this isn’t the first time the company has dabbled in this area. Likely, its experience working with the NBA and the Olympics paved the way for Amplify. Twitter also announced TV ad targeting, a new tool that lets advertisers easily monitor when/where TV ads air, coordinate tweets and gauge social media response to them. Meanwhile, Shazam is hard at work on boosting its second-screen mojo as well. Sure, most of its 93 million+ U.S. users still consider it just a music-tagging service, but the company is on a mission to prove that it’s serious about television. Shazam has long been able to identify TV programs and ads, but users always had to tap the screen to make it work. Now iPad users can turn on the new AutoTag feature instead and simply let it tag in the background. The application listens for identifiable content and then auto-loads related information in the carousel at the top of the screen. Users can sit back and watch as cast details, soundtracks, gossip, trivia, social media, official websites and more populate the app, along with any related buying links. For sports, the app can even grab schedules, stats and scores. And for advertisers, commercial-tagging can be an extremely interesting scenario. Considering that the app supports 160 channels of live or DVR’d TV content, spanning all nationwide programming and most nationwide TV commercials, that’s an incredible load of tagging we’re looking at. The company also tweaked the interface for its iPad app, so users can view trending TV shows (U.S.) and songs (around the world), enjoy enhanced social features and see fullscreen song lyrics. 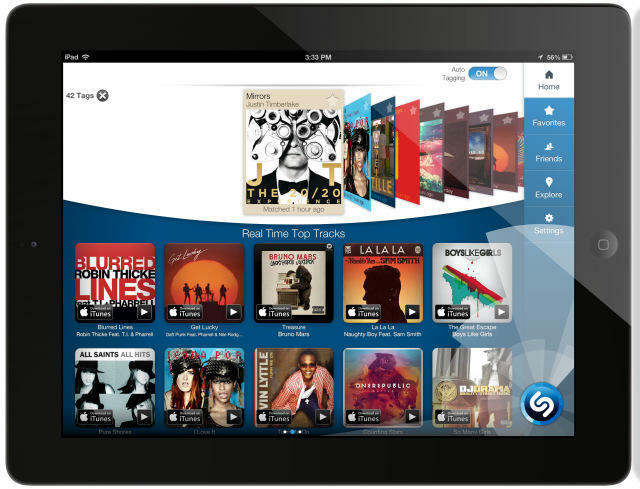 For a closer look at the new Shazam for the iPad, hit the video below.